Isobrite makes a pretty cool line of military, law enforcement, and tactical style watches. Along with those they also have a pretty cool diver called the Master Diver. There are two versions of this master diver, the ISO504 with the rubber strap and the ISO502 with the PVD coated stainless steel bracelet. I really like the Isobrite line of watches because they are the few watch companies that use T100 tritium, which I will talk about later. I was able to get a hold of the Isobrite Master Diver ISO504 sample watch for review so let check this out. This is a simple 3 hander with a date at the 3 0’clock position. The face has a wavy pattern which looks good and, let’s admit it, fits the theme for a diver. The hands on this watch look very much like the hands on an Omega Seamaster Planet Ocean, which is fine with me because that’s one of my favorite watches. These hands are connected to a reliable Swiss-Made Ronda 715Li quartz which is powered by a lithium battery that can last up to 10 years . Oh, it’s also worth noting that the hour markers and numbers are applied, which adds some dimension to the dial. The Isobrite Master Diver is not a small watch or a lightweight. Made from 316l stainless steel, the case is 46mm wide and 15mm thick. The weight with the rubber strap is 7 ounces (aka, just under 200g) – surprising, considering the quartz movement. Topping the case, the bezel looks great with the brushed and textured finishes, and even a bit of polish on the sides. The only issue I have is that the black PVD case is polished. This is not wrong, per se – I just feel it would look so much better in more of a matte finish. As far as living up to the Master Diver name I would say it does. The water resistance on this is 1000 feet and you don’t need more than that for a serious diver watch. Made from NBR rubber, also know as Nitril rubber, this strap is very soft and comfortable. The strap is perfect for diving since its durable, flexible, and chemical resistant. It does tend to be a little bit of a lint magnet but wipes off easily. The clasp is a standard pin and buckle and there are plenty of holes to get the right fit. It’s worth noting, our review model is a sample model and does not have the signed buckle (production versions will have a signed buckle). With the exception of the lume painted on the bezel and tips of the hour and minute hands, the glow comes from tiny glass vials filled with tritium gas, which is an isotope of hydrogen. There are vials on each hour marker, hour, minute, and second hands, and also at the 12 o’clock position on the bezel. These vials are coated with a phosphorescent paint which react with the tritium gas. The most common tritium watches use T25 tritium tubes which have 25 millicures of tritium gas. On the Isobrite watches they use T100 tritium which has 4 times the amount of tritium gas. This creates two great things. The watch glows four times more brightly and it also last twice as long. Most t25 tubes will glow up to 25 years but the t100 tubes can glow up to 50 years. The intensity of the glow will start to drop off half way into that life cycle but that’s still a pretty long time. The Isobrite Master Diver is big, heavy, and pretty cool. With the water resistance of 1000 ft. this can be used for any type of diving you want, maybe with the exception of saturation diving. The tritium T100 tubes provide all the light you will ever need to see the time in the darkest of places. 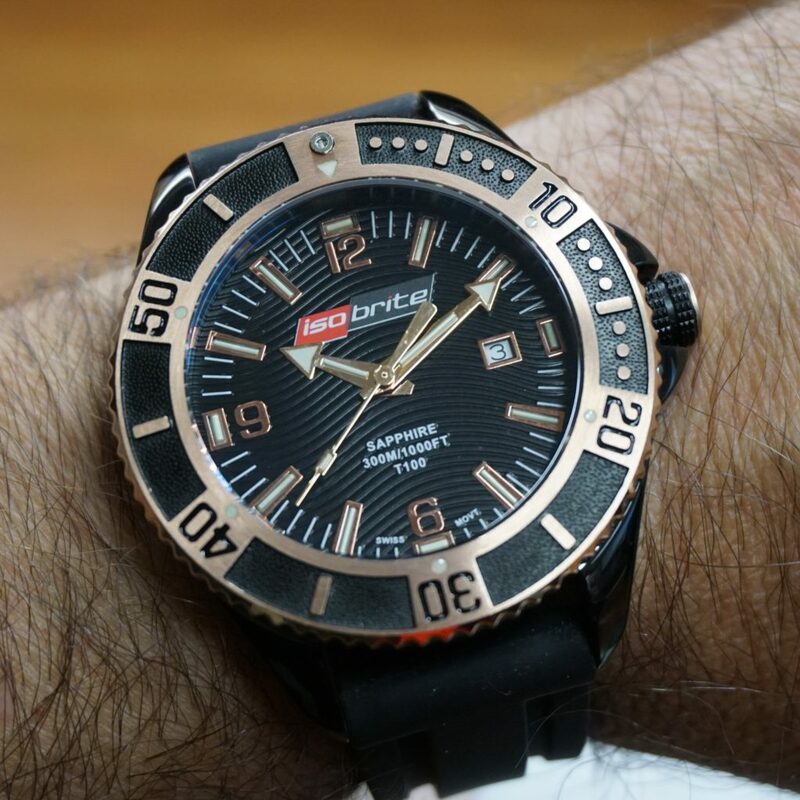 The price on the Isobrite Master Diver ISO504 is $520, which is not bad for a T100 tritium watch, especially when compared to some of their competitors. You can check them out at armourlite.com. Who’s it for? Divers and desk divers alike. Would I wear it? Sure would, I love tritium. What I’d change: Would like a matte black finish. The best thing about it: That bright tritium glow. This Isobrite Master Diver looks very good, except one thing, which is the color red in the name. In my opinion that is unwanted.